Repair shops come in all shapes and sizes. 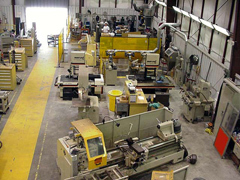 But the one thing they have in common is the need for repair shop software that has accurate job costing and tracking. If you are billing out on a time and material basis then it is imperative that you have all of your costs associated with the job in before you invoice the customer. Repair shops also need to move jobs in and out on a timely fashion, so scheduling is critical to hitting customer due dates. The E2 Job Shop System gives you the flexibility to handle all of the unique situations a repair shop encounters. Accurate job costing and tracking. The bar coded data collection will help you track exactly where the job is on the shop floor and the total costs associated with the job. The powerful, yet flexible scheduling whiteboard allows you to schedule the shop floor realistically. So when your best customer calls looking for that hot job, you can quickly drag and drop it to the head of the line! Time and Material billing will guarantee that your invoicing is accurate and all inclusive.